Le Jardin de la France, the central Loire Valley, with its soft vistas and magnificent castles, has been home to Grandin since 1886. A lawyer, passionate about wine and married to a young woman whose family owned a vineyard in Ingrandes-sur-Loire, he was to gain notoriety rapidly, both in Paris and abroad. The Grandin range is mainly composed of sparkling wines manufactured according to traditional methods, Brut and Demi-sec, Rosé and the famous Cuvée de Réserve, Crémant de Loire and vintage Crémant de Loire Rosé (AOC). Grandin is a brand of the Boisset company. Today, the Grandin property is still located at the château in Ingrandes-sur-Loire, with its old La Bouvraie cellars, which supply the optimum ageing conditions for the Crémant de Loire Henri Grandin. The picturesque castle and its age-old cellars produce wines of excellent quality using the purest traditional method. Thanks to its positioning as a quality product, and to the characteristic style of its wines, Grandin has an excellent reputation around the world. The Traditional Method, developed in the 18th century, is the method used to produce the greatest sparkling wines. After the grapes are pressed, the juice ferments, resulting in still wine that does not have any gas in it. To this basic wine a small quantity of drawing liquid is added to induce a second fermentation. After the first fermentation, the wine is bottled. The bottles are corked and, effected by the action of the yeast, the second fermentation starts in the caves of H. Grandin, away from light and heat. The second fermentation is what causes the wine's effervescence. This stage is called the prise de mousse (effervescence taking stage) Once the fermentation is over, the corked bottles are stored for nine to twelve months. The permanent contact of the wine with the lees of the second fermentation constitutes the second stage during which the characteristic subtlety and finesse of Grandin develop. Following this period, the bottles are laid on their side in wooden cabinets with their neck facing forwards. They are then rotated a quarter turn each day and gradually raised to a vertical position so as to allow the lees to collect on the cork. Once the deposit of lees has accumulated on the cork, the bottles are quickly opened. The deposit is pushed out by the carbonic gas in the solution, before the bottles are immediately re-corked and the wire cap attached. After a final resting period, the bottles are labelled and made ready for release. Produced exclusively to Methode traditionelle, Grandin sparkling wine is elegant, with an exceptional bouquet and exquisite aromas. The bubbles are small, with a rich and persistent taste. The palate is enchanted by freshness, a perfect balance and long finish. 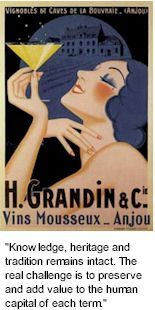 Grandin sparkling wine should be served chilled, at around 6 -9 C. An ideal accompaniment to fish, shellfish and white meat, Grandin is also delicious as an aperitif.